Jane Austen’s Northanger Abbey pulls off the difficult feat of being both relentlessly self-reflexive and (on the whole) a genuinely enjoyable read. It is, after all, a commentary on the writing and reading of novels, and more specifically on the then-popular genre of the gothic romance. The commentary is both diegetic and extradiegetic: conveyed by individual characters and also by a narrator who claims (to some extent at least) to transcend and stand outside the action. I say that the narrator is only able to transcend the action “to some extent” in that she (or he) recognizes that this novel, too, is bound by (or chooses to be bound by) many of the same conventions that structure the object of its reflection. Hence the form of Austen’s novel itself also provides a commentary on novel-writing and, again, on popular genres in particular. Any distance that Austen takes from what she (or her narrator) sometimes calls her “sister author[s]” (81) can only be temporary or provisional. Ultimately, they are all in this together even (especially) if Austen chooses to parody and so implicitly criticize (but also mimic) some of the structural expectations of the genre. To put it another way: this is a novel that repeatedly switches between critique and indulgence. It plays a double game of ostensibly taking its distance itself from the gothic commonplaces (“gloomy passages [. . .] ponderous chest[s] [. . .] unintelligible hints [. . .] violent storm[s]” ; “dreadful situations and horrid scenes [. . .] midnight assassins or drunken gallants” ) that it so hilariously sends up, and at the same time indulging itself in precisely these same clichés. It’s as though Austen were allowing us to partake of a guilty pleasure: her critical jabs at the genre absolve us of most of the guilt, and leave us with almost all the pleasure. In short, here Austinian irony comes close to the postmodern sense of the term: a knowing imitation whose knowingness supposedly absolves it from complicity. Except that Austen doesn’t quite let her readers–or even herself–off the hook. She undoubtedly agrees with Henry Tilney, her heroine’s suitor, that “the person, be it gentleman or lady, who has not pleasure in a good novel, must be intolerably stupid” (77). We can’t, or shouldn’t, deny the pleasure that novels bring us. But this is not to say that we cannot question that pleasure. Indeed, Austen has quite a complicated relationship to pleasure: she is far from averse even to the simplest (“unaffected” ) of pleasures, and indeed is skeptical of the mannered pedagogy in taste that Henry elsewhere offers in the form of a “lecture on the picturesque” (81). At the same time, she is consistently critical of those characters whose only concern is with their own pleasure, and who neglect therefore duty and responsibility. 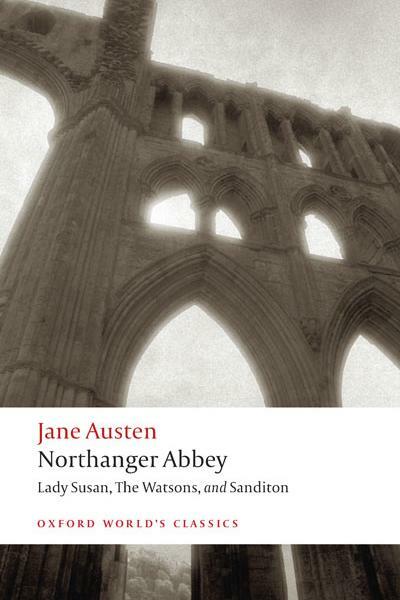 A novel, for Austen, also has its responsibilities–and in the case of Northanger Abbey, that involves perhaps above all an education in the power of self-reflection, and its significant but subtle difference from self-regard. Ultimately, however, I think that Austen shows herself to be dissatisfied by her approach in this early novel. Her rush to conclude at the end, jumping through the hoops of formulaic conventions without taking the time to allow us to enjoy them, pulls the rug from under our feet. In the novel’s final few pages, which hurtle us towards our hero and heroine’s marriage (“the bells rang and every body smiled” ), while reminding us rather too insistently of “the rules of composition” (186), feel churlish at best: as though she felt she had to fulfill the promises that her acceptance of generic conventions implied, but no longer got much pleasure in doing so… or perhaps feared that she had already over-indulged both herself and her readers. There is something anticlimactic about this conclusion, and it makes sense that in subsequent novels she will perfect a properly Austinian irony, leaving behind the (perhaps too crude) pleasures of imitations whose knowingness is never alibi enough.